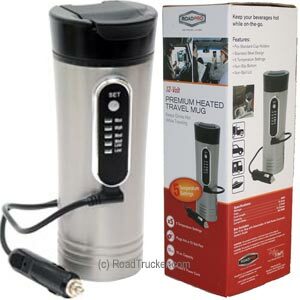 RoadPro 12-Volt and USB Powered 15oz Premium Heated Travel Mug Keeps your cup of Coffee hot. Give your Trucker that Hot Cup of Coffee anytime, anyplace they choose. Marissa bought 2 of these and She uses them every time we go someplace because her and her parents drink Hot Tea all the time. They work very well. Water heats very fast and then keeps it hot. And there is not much to cleaning since they only use it for water. There is little, that is more satisfying then a fresh hot cup of coffee while on the road. The only problem is that it usually does not stay hot for very long. With the RoadPro Travel Mug, that is no longer a problem. 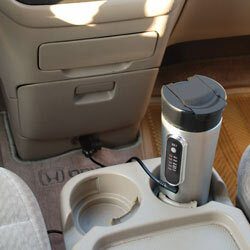 Just plug it directly into a 12-Volt Power Port and your coffee will stay hot, no matter how slow you drink it. Better yet, use it for water for tea. No fussy cleaning up when your done.